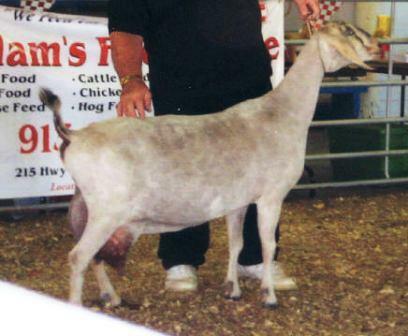 GCH GODDARD FARM GRETEL, 1*M, A DAUGHTER OF GCH ++*B SPLIT CREEK SPINNING TOP, WAS OWNED AND SHOWN BY BRUCE AND NANCY NICKEL, NICKEL NUBIANS, CLARK, MISSOURI. 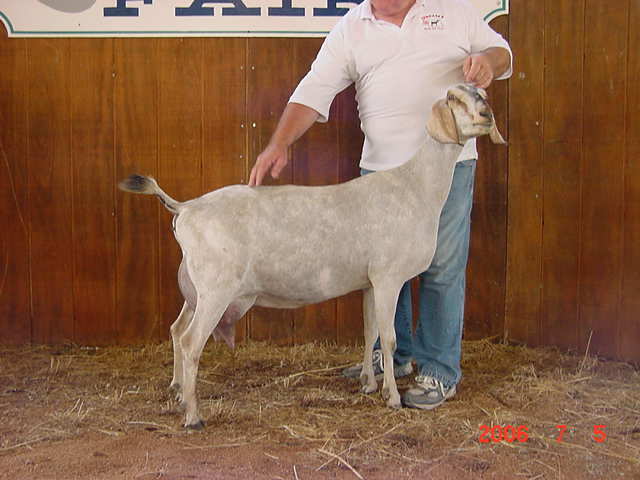 THE NICKELS FINISHED GRETEL DURING THE 2004 SHOW SEASON. 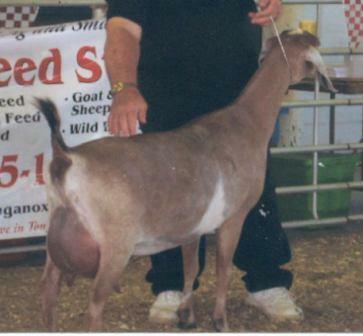 WE SOLD GRETEL TO THE NICKELS AS A 2-YEAR-OLD FIRST FRESHENER, ALONG WITH GCH RAISIN PIE, ANOTHER SPINNING TOP DAUGHTER, BOTH OF WHOM THE NICKELS FINISHED. 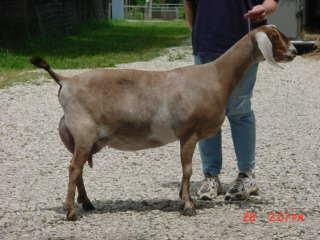 GRETEL ATTAINED BREED LEADER STATUS BASED ON HER LACATION COMPLETED IN DECEMBER 2003 WITH 4490 LBS. 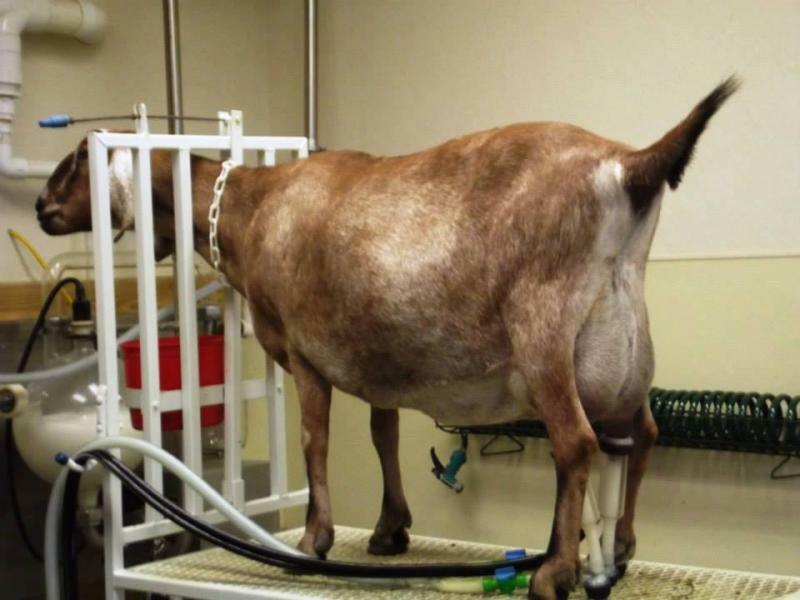 OF MILK IN 305 DAYS ON STANDARD MILK TEST. 3-00, 305, 4490, 3.8% 171, 3.4% 152. 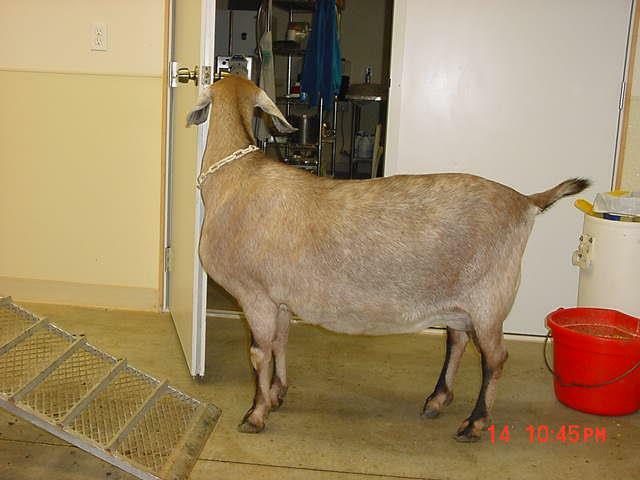 BOTH GRETEL AND HER SIRE ARE BLOOD TESTED CAE FREE AND DNA TESTED G6S NORMAL. 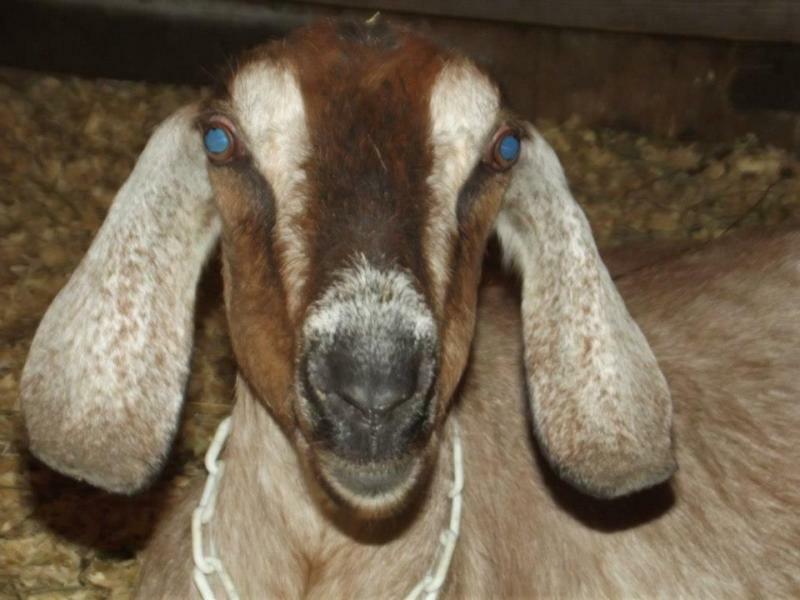 WE ARE MOST GRATEFUL TO BRUCE AND NANCY NICKEL FOR THEIR HARD WORK IN MANAGING, MILKING, AND SHOWING THIS ELEGANT DOE. 3-00, 305, 4490, 3.8% 171, 3.4% 152. 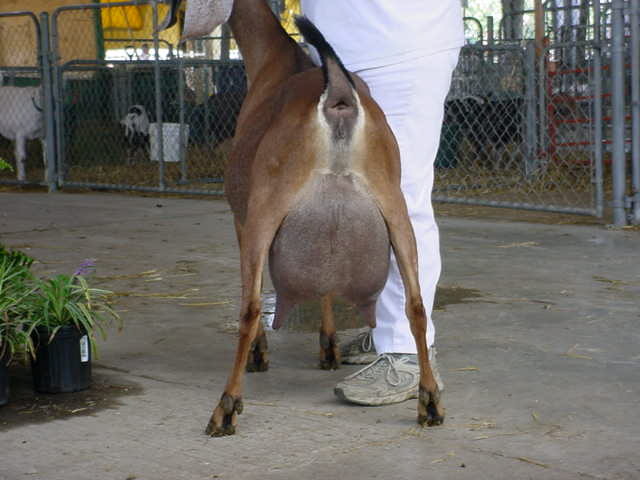 HERE IS AN OPPORTUNITY TO INCREASE THE POWER, STRENGTH, MILK AND SHOW QUALITY GENETICS IN YOUR NUBIAN HERD. 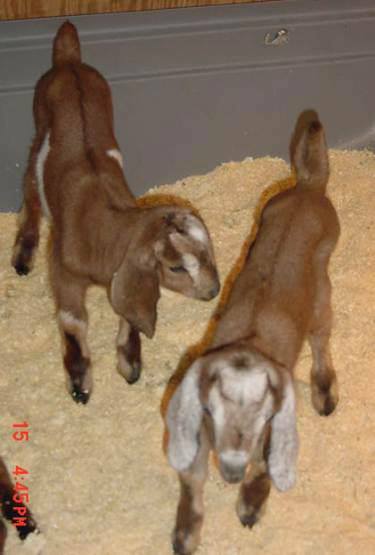 RESERVE A KID FROM PROVEN GENETICS. 5-00, 305, 3562, 4.6% 165 lbs., 3.7% 131 lbs. 6-11, 305, 3620 LBS., 159 LBS., 137 LBS. 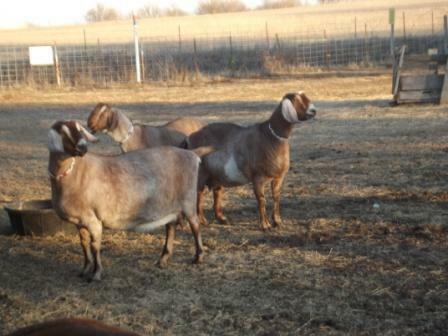 Goddard Farm Lingon Berry, Red doe in the center, a 2-year-old first freshener, owned and shown by the Tom and Christine Reed Family, Crown Point, Indiana. 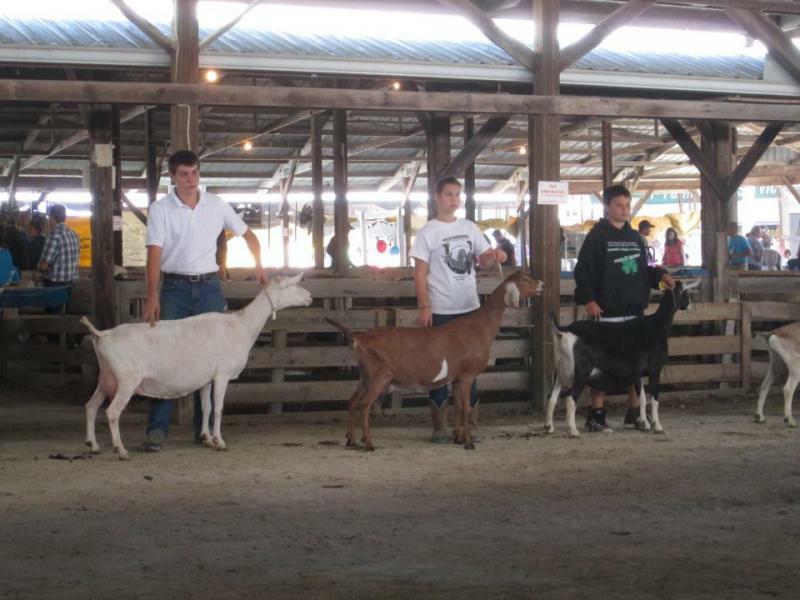 Lingon Berry is pictured above at the recent 2012 Fair show in Sandwich, Illinois after winning grand champion Nubian. 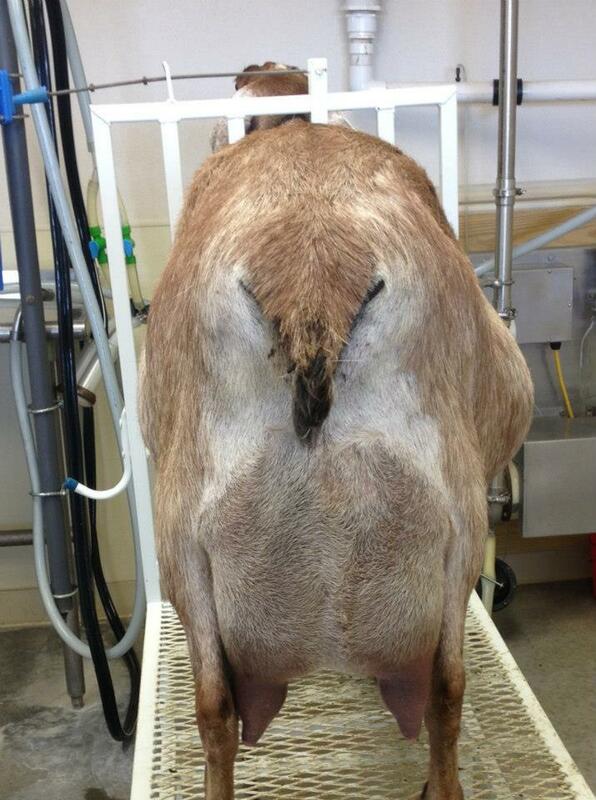 We congratulate the Reeds for the fine manner in which they have managed and shown this doe. 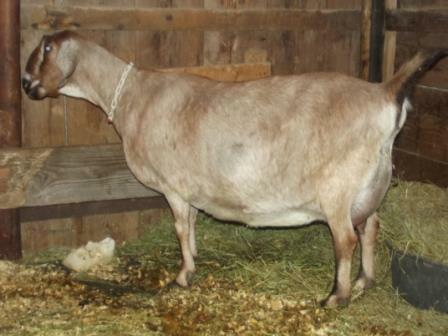 Lingon Berry is the litter sister of Goddard Farm Blue Berry who went to her new home in the Philippines. 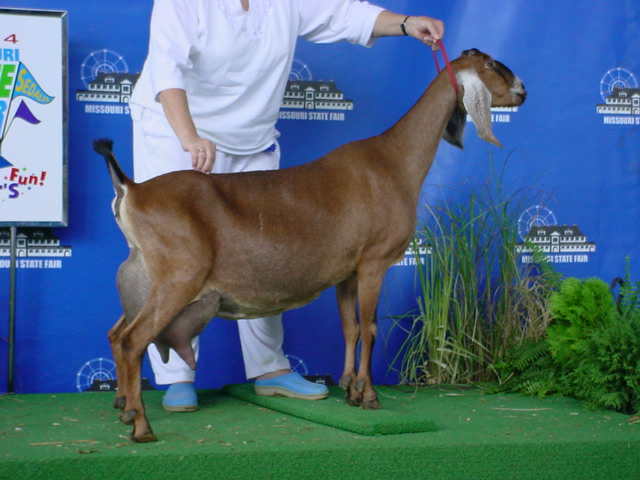 Lingon Berry is the daughter of Goddard Farm Raspberry, 3*M, (pictured above) one of our Top Ten ADGA Breed leaders. 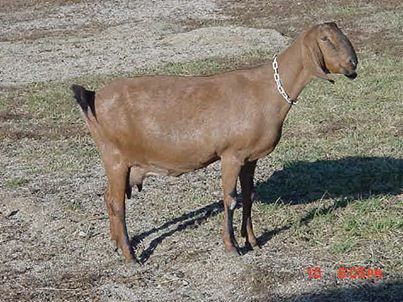 Lingon Berry is another illustration that Nubians can be successfully bred for both show and milk production. 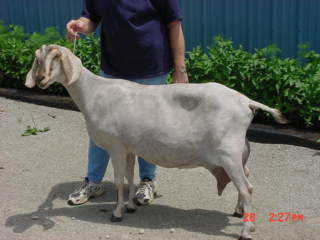 MISTY IS THE ADGA NUMBER ONE TOP TEN NUBIAN BREED LEADER IN 2012. GODDARD FARM MISTY 4*M IN THE DAIRY PARLOR EVENING MILKNG APRIL 14 - 2011. 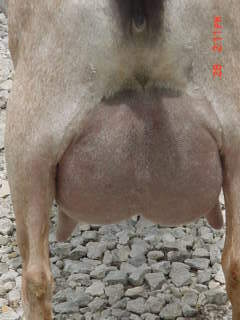 MISTY IS THE GRAND DAUGHTER AND DAUGHTER OF OUR ADGA TOP TEN MILKERS. 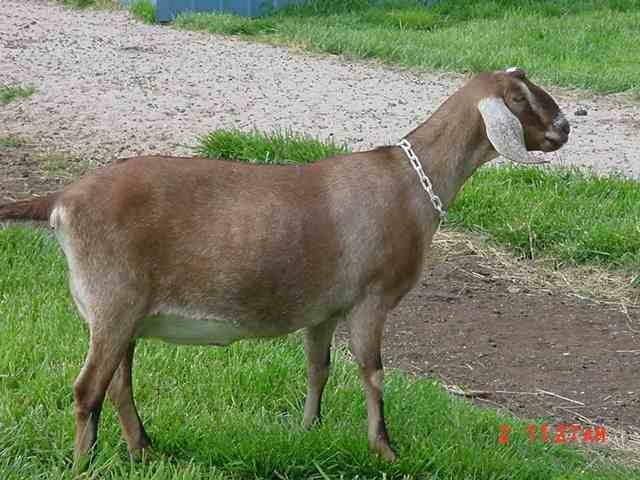 MISTY IS OUR ALL TIME HIGH MILK PRODUCER & ADGA NUMBER 1 TOPTEN BREED LEADER FOR 2012. 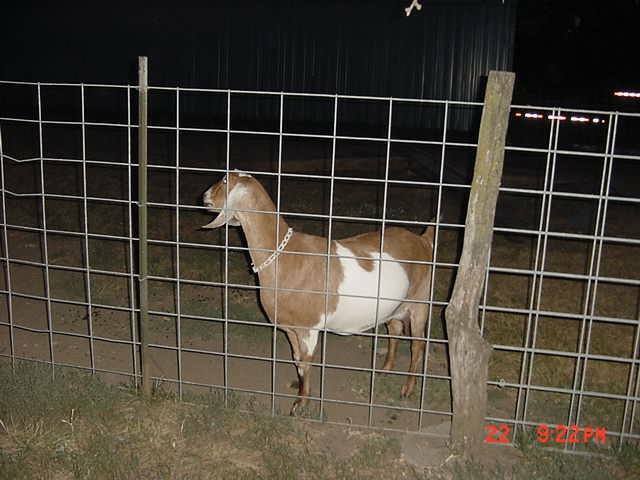 Goddard Farm Misty, 4*M, 4-year-old, In Labor, kidded at 1:30 A.M. on Saturday, April 13, 2013, with twin doe kids. 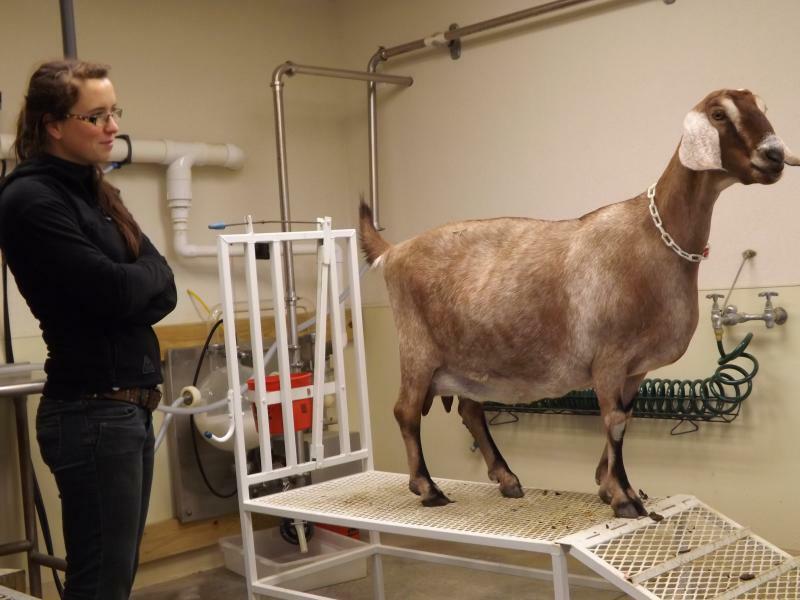 Misty was given molasses water as a reward for a job well done. She also got a handful of peanuts in the hull. 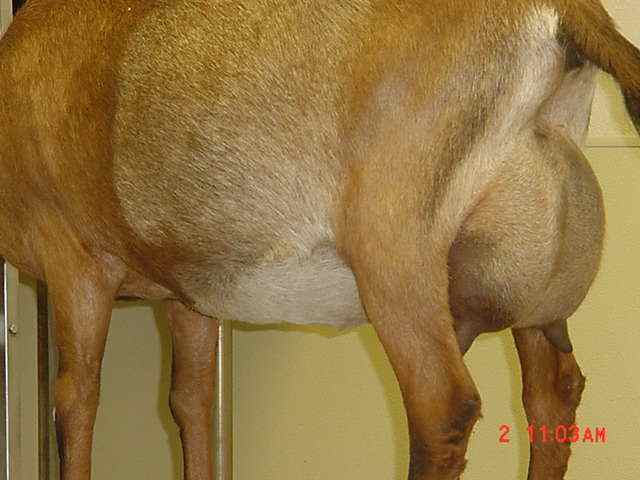 4-year-old Goddard Farm Misty 4*M, picture on April 24th., 2013, "socked on" rear udder at 11 days fresh, with twin does, on the milk stand in the dairy parlor. GODDARD FARM MISTY, 4*M --- AUGUST 5TH., 2013 --- ON THE MILK STAND. ON THE MILK STAND OCTOBER 6TH., 2013.